When the Tesla Model S was launched, it looked rather like the mature big brother sedan to the fast and funky Roadster. But all that has come to an end with the inclusion of the “Insane Mode” button on the new Model S P85D. Not only does the car rocket from 0-60 faster than a Roadster 2.5S, it includes a little extra kick for that jump up to 70mph. The YouTube channel DragTimes filmed some passenger reactions to show just how aptly named the ‘insane mode’ is. It takes some serious cojones to add a button to ones dashboard and label it ‘insane.’ But on the other hand, no one has ever accused Tesla founder Elon Musk of backing down from a challenge, or of being sane. In plainer English, however, ‘Insane Mode’ is mostly a wittier term for “launch control,” a feature on many current sportier cars. What features like these do, is provide an electronic assist and greater traction for accelerating from a standing start. It’s really useful if you’re into drag racing, professional racing, or terrifying your passengers. The latter of which being precisely what the Tesla P85D’s Insane Mode does, albeit in a sleek, handsome, electric sedan. And as an electric sedan, the P85D is phenomenally impressive. Indeed it can stand up against, and above many a luxury, gasoline-guzzling sedan. The P85D has 691 horsepower and features dual motors for all-wheel-drive. And in Insane Mode? It launches from 0-60mph is a heart-stopping 3.2 seconds. 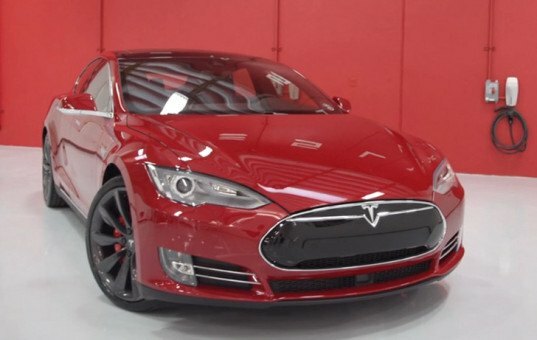 When the Tesla Model S was launched, it looked rather like the mature big brother sedan to the fast and funky Roadster. But all that has come to an end with the inclusion of the "Insane Mode" button on the new Model S P85D.